People of every faith share a common home that is threatened by climate change. Learn ways of making a faithful response, starting here in Pennsylvania. Participants will learn from scientists, policy experts and lawmakers about ways to reduce harmful footprints on the planet and be prepared for advocacy for our common home. This program is free, but please register at the bottom of the page so that you can receive materials in advance and so that presenters and hosts are prepared to best accommodate guests. This is part of a day of fellowship, service and learning for people of all faiths. Learn more, below. Come to the Welcome Table! and join neighbors of many faiths for service, learning, prayer, artistic expression and a community meal — all with an emphasis on strengthening what unites us. 1:30-8:15 p.m. — Ribbon Tree Prayer Project — People of every faith share a common home that is threatened by climate change. Participants will be invited to reflect on what they love and would not want to lose to climate chaos and to write that on a ribbon that will be tied to a tree. Those who cannot attend in person can send their ribbons in advance. Throughout the day, participants will be encouraged to read the ribbons, and at the end of the day, to take one or more home with them and commit to pray for the concern and for the healing of the earth. Location: Kunkel Plaza, Front and State streets, Harrisburg. Civil Conversations Project Facilitator Training — Springing from the “On Being” Civil Conversations Project and led by Interfaith Philadelphia, this training will give participants the skills to organize Civil Conversations in their congregations, workplaces, and communities. These sessions offer community leaders and “bridge people” techniques for grassroots civil conversations that support a thriving religiously diverse democracy. Training is free, but space is limited and registration is required. This training will last from 1:30-4:15. Attendees will receive a certificate of participation hours. Location: St. Stephens Episcopal Church, 221 N Front St, Harrisburg, PA 17101, just 3 1/2 blocks from the Interfaith Blessing of Waters. Register here. Volunteer Service at Wildwood Park — Roll up your sleeves and spruce up the park. Volunteers may be weeding, picking up trash along the trails, trimming to make the trails easier to traverse or other things that go into maintaining this community environmental treasure. We’ll have a better idea of what you can expect as May 19 approaches and will email registrants more specifics. Volunteers should dress to work outside and get dirty if necessary. This program starts at 1:30 (though later arrivals can be accommodated) and ends at 3:30 p.m. Location: Wildwood Park and Olewine Nature Center, 100 Wildwood Way, Harrisburg, PA 17110, a 12-minute drive from the Interfaith Blessing of Waters. Please register here to receive updates and waiver, and so that park staff can prepare. Hiking and Arts Trail at Wildwood Park — There are many ways to enjoy Wildwood Park and Olewine Nature Center, but this spring brings something new — Art In The Wild trailside art installations. Start at the Olewine Nature Center anytime after 10 a.m. to pick up an Art In The Wild brochure and enjoy the free exhibits about wetlands. Then, head out to the trails for a three-mile walk. The park manager recommends starting on Wildwood Way Trail and taking the loop around Wildwood Lake, which leads to the Towpath Trail and back to the nature center. Give yourself plenty of time to get back for the Interfaith Blessing of the Waters at 4:30 p.m. Location: Wildwood Park and Olewine Nature Center, 100 Wildwood Way, Harrisburg, PA 17110, a 12-minute drive from the Interfaith Blessing of Waters. Volunteer Service at Caitlin’s Smiles – Volunteers will creatively put together “Bags of Smiles.” Caitlin’s Smiles provides children in hospitals with arts and crafts kits and homemade cards. Please register here as space is limited to 30 participants. Click here to learn more. Program begins at 2 p.m. and ends at 4 p.m. Location: 3303 N. 6th St., Harrisburg, PA 17110, a 10-minute drive from the Interfaith Blessing of Waters. Volunteer Service at the Five Senses Gardens – Volunteers will do some light gardening at this one-of-a-kind sensory experience part of the Harrisburg Area Greenbelt. Click here to learn more about the garden. Register here. Dress appropriately. Program begins at 2 p.m. and ends at 4 p.m. Location: Click here for directions. A 12-minute drive from the Interfaith Blessing of Waters. Eco-Justice Tour -- Learn about the social justice ramifications of choices that affect our environment, as well as ways to build resiliency. Details to come. Contact us here and write "ECO-TOUR" in the subject line if you wish to receive an email with details when they are available. 2016 Interfaith Blessing of Waters at Kunkel Plaza. Photo by John Pavoncello. 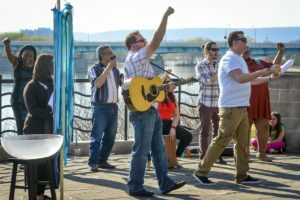 4:30-5:15 p.m. — Interfaith Blessing of Waters — Susquehanna River at Kunkel Plaza, Intersection of Front and State streets, Harrisburg. 5:30-6:30 — The Welcome Table — Join us for a community meal with an emphasis on unity. Tickets are $20. Make reservations here by May 12. Location: Pine Street Presbyterian Church, 310 N 3rd St, Harrisburg, PA 17101, 3 blocks from Kunkel Plaza and Blessing of the Waters. 6:30 – 8 p.m. — Caring for our Common Home — Learn ways of making a faithful response to climate change, starting here in Pennsylvania. Participants will learn from scientists, policy experts and lawmakers, including Rep. Chris Rabb, about ways to reduce harmful footprints on the planet and be prepared for advocacy for our common home. This program is free, but please register here so that you can receive materials in advance and so that presenters and hosts are prepared to best accommodate guests. 8:00 p.m. — Depart in Peace with Prayers — Participants will be invited to take a ribbon from the tree and pray for the concerns of the person who submitted the ribbon as well as the healing of the earth. If you have any questions or problems with the registration process, please contact the office at 717-545-3500.